Somewhere, somehow, someone forgot to invite the Koreans to America’s cavalcade of Asian-food fads and trends—until recently, that is. During the last decade, it’s felt as if Korean restaurants started popping up out of nowhere. And, especially in the last year or so, some have. But many have been there for years, unnoticed, hiding in plain sight as you drove past them on Kearny Mesa’s Convoy Street. Suddenly, they seemed as common as sushi joints. First to gain the public consciousness was Korean barbecue. “Barbecue,” of course, sounds familiar, and the flavor profile is readily accessible to our palate. We know and love meat cooked over fire and the sweet, garlicky, peppery flavor of bulgogi seems familiar. While all-you-can-eat Korean barbecue places are the current rage (Manna Korean BBQ at 4428 Convoy St. in Kearny Mesa is quite good), undoubtedly the best Korean barbecue in town is atDae Jang Keum (7905 Engineer Road in Kearny Mesa). Its barbecue is cooked over real coals, not a gas grill, and both the quality and variety of the meats available is unparalleled. The resulting flavors tap into something deep, a gustatory image drawn from the collective unconscious. But Korean food is a lot more than barbecue. It is also bibimbap (which translates as “mixed rice”), a dish of rice topped with sautéed and seasoned vegetables, sliced beef and a fried egg and offered with gochujang (a characteristic Korean chili paste). One of the best bibimbaps in town is at Grandma Tofu and Korean BBQ (4425 Convoy St. in Kearny Mesa). The vegetables are extremely fresh, but it’s the rice that really makes the difference. It has a shiny glint and is both savory and sweet, each grain its own entity, neither too hard nor too soft. Korean food is also banchan, an amazing panoply of side dishes brought to the table at the start of each meal to be shared by all diners. The most famous banchan is kimchi. It would be no exaggeration to say that kimchi is Korea’s national dish but more accurate to say it’s a whole class of fermented side dishes, with the napa cabbage version being the most familiar. But kimchis are also made of cubed daikon radishes, cucumbers, scallions, seaweeds and even shellfish. To a Korean, a meal without kimchi is incomplete. 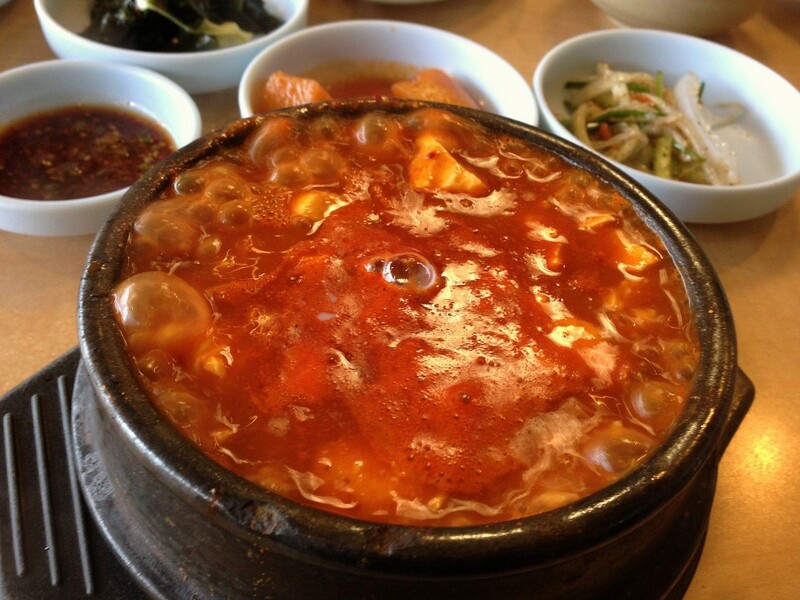 And Korean food is soft-tofu stews. Some of the best can be found at Convoy Tofu House(4229 Convoy St. in Kearny Mesa). Its best offerings may be the curry soft tofu stew and the dumpling soft tofu stew. The curry version is exceptional, with the raw egg (cracked by you) melding with the curry and chili flavors to create a symphony that is a whole while each part still stands separate and distinct. It is, perhaps, tofu stews that best explain where Korean food in America has been all these years. The cuisine is uncompromising and uncompromised, and many of the dishes are foreign to the American palate. It’s not been dumbed down for our consumption. No California roll here. No chop suey. It is what it always was, and it is good. The Koreans have always been at the party; we’re just noticing them now.